How WP-Ban plugin can put an end to excessive blog spam comments for good! OOoh, it’s been driving me CRAZY! Canada Goose, Canada Goose, Louis Vuitton, Ugg boots, spam, spam, spam. I had it all under control with Ak’ismet until recently. Akismet in WordPress Jet Pack at least stops all this spam from publishing to my site and holds in a separate folder for me to moderate. For months its been fine, but then about 4 weeks ago I started getting spam comments about a site that sells fake Canada Goose products. The funny thing is, they are targeting this one post with their spammy comments – Why Google thinks your blog comment is spam. It started small, but then increased to sometimes up to 500 spam comments from them a day! Because isn’t always 100% accurate I had to go through all of those comments to check for any valid comments before deleting them and it was starting to cost me time and my sanity every day. I even wrote to the site being advertised and told them what I thought of their spamming policy and asked them to stop. Another waste of my time, but I didn’t know what else to do. I know that I can ban IP Addresses using my htaccess file on my server, but well, I did that once before with near disastrous results. Instead of typing deny, I typed deby, copied across the deny list to my other site and managed to instantly take down both of my sites with my stupid mistake and only find out about it hours later when I had no idea what I had done wrong! So I was reluctant to go making any manual changes to the files on the server. That’s when I found WP-Ban plugin. It’s changed my life – well, it’s changed my day anyway because I no longer have to troll through hundreds of spam Canada Goose comments to check for real comments before deleting all that spam. Now I simply add the IP address of the spammer to my Ban list and they can’t get to me anymore. Sorted. Let me show you briefly how WP-Ban plugin works. 1 – download and add WP-Ban plugin, and activate it. 2 – In the left hand menu under settings, click Ban to get the settings and options page for the plugin. 3 – Open your spam comment folder in a new window so you can have both open at once. 4 – Find the spammer you want to ban and copy the IP address from their comment. 5 – Go to the Ban settings page and paste the IP address into the Banned IPs box at the top. You need to put each IP address on a new line. 6 – Save. 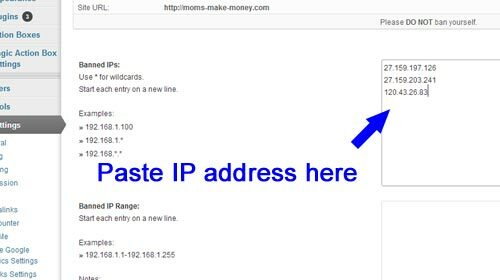 You can also add in IP address ranges and other options, but for the purposes of getting rid of the comment spammer, this simple option should work. 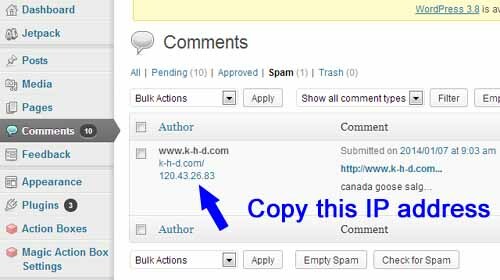 You should be aware that comment spammers use a range of IP addresses and aliases and with the Canada Goose spam it took me several days to deal with all the IP addresses that kept popping up. You also have the option to leave a message explaining why a person has been banned and I think this is a good idea just in case an error happens and a genuine reader is banned by mistake. Here is my ‘you are banned’ message. Enjoy all the extra time you’ll have every day now you don’t have to deal with all that Canada Goose spam, and others. SO Glad I found you Holly. There must be so many other bloggers out there wasting their time with this nonsense every day. Was driving me crazy. I don’t like to keep on adding lots of plugins to my site, but this one really does earn its place there. You should notice a big improvement very quickly, and you’ll get a little table at the bottom of the settings to show you how many times the IP address tried to get in so you can see it working. Thank you for this tip. I will use it tonight. So tired of the spam! My Akismet hasn’t been catching it all lately – so frustrating! I just went through and banned about 20 spammers. I’m hoping it will slow down now that I have this plug-in. This has been so helpful, thanks so much! No more geese, uggs, sunglasses and purses! Wahoo! Great Val, I hope this makes a real difference for you. This isn’t going to work on Blogger, probably, right Deby? No, I’m sorry Linda. This is a plugin that only works on WordPress sites. Perhaps its time to make the move! Interesting. I had not heard of this one. I use askimet and it separates all my spam and has only missed 2 in the las year! Thanks for linking up to the all things pretty party. Such a great reference. I too have been dealing with some annoying spam. Thanks Deby for your help! Brilliant! You’ll soon sort it out with this option Nancy.